← Happy New Year from Sam and the dunes! 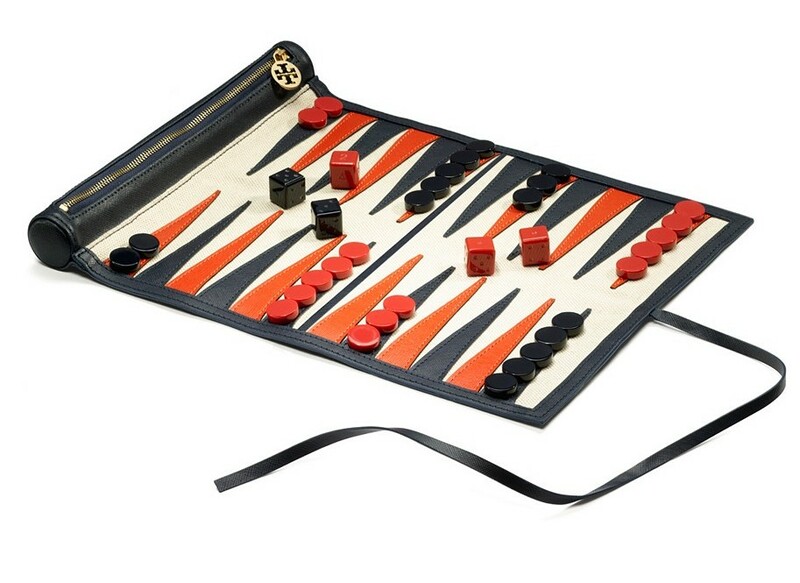 Made out of canvas and leather, this foldable Backgammon set doesn’t take much space in your luggage. A perfect game to bring along and play whenever you have a dull moment at the airport. Make sure, though, that the guy in the next seat is also a Backgammon lover or exchange (seats we mean, not games). Packing jewels can be difficult but this petite case makes it easy to bring your favorite accessories wherever you go. Of course, our beloved Sam also wants to travel in style. With this collapsable water bowl our cute pooch doesn’t have to be embarrassed because he is forced to drink from public fountains. Posted on January 6, 2013, in DIY & shopping and tagged Backgammon, Collapsable dog bowl, designer, fashion, jewelry case, Tory Burch, travel. Bookmark the permalink. 5 Comments. I love the jewelry case! I keep mine in a silk bag that I picked up in Salzburg years ago … the zipper pull fell off, but I love it so much that I can’t bear to part with it. This case may make me change my mind! These are great – I love travel accessories!